A Spiritual Self Help Guide To Understanding Ego-Self and Higher Self! The Heart Of Spiritual Reality! This spiritual self help guide is written from the perspective of an actual spiritual guide, a personal guide who knows certain truths and who wants to help others to know the truth concerning the nature of our spiritual existence. Several ideas are covered with an aim that you will assist you to become more aware of your spiritual nature. This bite-sized spiritual self help guide goes right to the heart of spiritual truth. Once you’re ready and willing to allow yourself to replace the illusion of control, which you think you have, with the idea of surrendering to your higher self then you’ll see that these loving reminders actually represent the epitome of self help and personal self-empowerment. Everything That IS has its roots in the realm of the spiritual. Everything That IS is primarily non-physical energy that is only separated from everything else by discrete vibrational frequency. Thus Everything That IS is not really separate, that’s an illusion! Everything That IS is infinitely and eternally connected within the idea of NOW. When discussing spiritual nature I never mean any type of organized religion or any kind of spiritual belief system. Although spiritual nature or All That Is includes those belief systems, this spiritual self help guide reminds you that those belief systems do not have a monopoly on getting to grips with an awareness of spiritual truth. "Be like me because you are like me." "What I am doing, you can do also." However, most people misunderstood their teachings and reflections, and so now we have endless organized religions and other spiritual belief systems, such as Buddhism - with many of them misinterpreting ultimate spiritual truth! Do you believe that you need a personal spiritual self help guide or guru to help you with spiritual understanding? That's perfectly OK, just as long as those kinds of people do not state something similar to: my way is the only way, all other ways are false, there is only one path to freedom and you’ll never 'get it' unless you follow me etcetera. When it comes to human thought and spiritual understanding I listen to ideas and opinions, but I accept no outside authority whatsoever! Waking up takes as much time as needed by each individual. You are a spirit being represented in physical form and expressing yourself using both your physical mind personality construct (ego-self) and your non-physical higher mind (higher self) here on earth. Your soul (the greater you) which is your true nature, who you really are, is that of a non-physical eternal spirit being. And even though at this timing you might not be consciously aware of this truth, You are guiding You on your adventure and game of life on earth. In order to play this game of remembering who you really are, it was necessary for you to agree to forget your true spiritual nature. Had you arrived on this planet with the full conscious awareness that you’re an eternal spirit being and a Master of reality creation, then playing this game of remembering who you really are would not have been possible! Understand now, that this is your transformational life experience - the life experience that you chose in which to incarnate for the purpose of waking up and remembering who you really are at the core of your being. You’re reading these words from a seemingly apparent other, but you brought yourself to this page in order that you’d read them in order to remind you of your true nature - that is clear! Upon waking in this world of intellect, logic and rationality the physical mind or ego-self reasoned itself to be king. Through schooling, nationalism and religion etcetera, the ego-self was conditioned to believe in duality and division, thus separation became its experience while pain and suffering became a normal part of its existential reality. And together with not feeling connected to the oneness of all life, the conditioned ego-self personality construct constantly lives in negativity and fear. Because the ego-self believes it’s disconnected from other selves as well as from the one Creator Spirit, its knowledge, which is always exclusively from the past, is always limited. However, once one’s ego-self understands (remembers) that it cannot possibly know more than the totality of that, which is both itself as well as all of All That Is, then it willingly relegates itself to the position of an adviser to the total self or whole being and no longer tries to control everything. In order to 'step up' your vibrational frequency for more clarity, it’s helpful to discontinue the continual self-chatter or internal dialogue from the rational mind of your ego-self and to think only pure positive thoughts. Pure positive thoughts that feel good to you can only serve to raise your vibrational frequency and thus bring you a positive reflection in the Universal mirror of your life experience. Until you’re able to think more pure positive than negative thoughts, the continuous, normally negative or judgmental self-dialogue holds you in a lower frequency place that doesn’t feel good to you. It’s all about conditioning. Some people find that meditation helps to end self-chatter and also holds them in neutrality, which is more beneficial than negativity. If you're currently experiencing negative ego-self and judgment issues and you feel attracted to a particular spiritual self help guide's system of meditation, which recommends breathing in a special kind of way or suggests meditating in a particular physical setting or time of day, then that advice might be just what you need right now, so give it a shot. To learn my personal story about meditation and my suggestions concerning how and why to meditate, please visit this self help meditation page. For additional information about meditation from another author, please visit this mindfulness-meditation-techniques website. There’s nothing within existence that’s not made from the One Creator Spirit. Everything That Is (All That Is) - is Spirit in different forms. Knowing this brings you to the realization that your body is your spirit in physical form. A changed form does not make it any less spiritual, so honoring your body through appreciation and love is always prudent. Another way of seeing this truth is seeing that you are both the observer and the observed. And once you know this beyond mere rational and intellectual understanding, at the core of your being, then you have remembered truth and you know who you really are and What Really Is. In order to really see this you have to look at it from the perspective of your higher self. 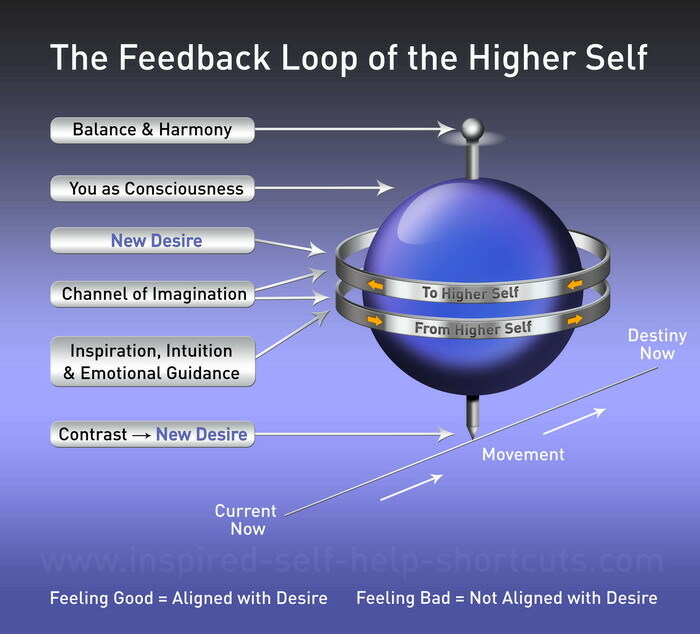 My idea of the mechanics of the feedback loop of the higher self. Your spiritual higher self is an energy split off of your total spiritual being or your soul, thus it's not separate from you, it is you. However, because your spiritual higher self exists as a higher vibrational frequency that’s beyond the perceptual range of your normal physical senses, it remains invisible to you as a physical being. Nevertheless, using the channel of imagination your spiritual higher self conceives your reality through your own imagination. In addition, your spiritual higher self unceasingly communicates guiding directions to you in the form of inspiration, insight and intuition. The only real question is: are you tuned in and thus listening to the self-empowering spiritual guidance coming from your spiritual higher self? This psychological self help page suggests surrendering to your higher self to find the shortest route to everything you want. As you probably now realize your spiritual higher self is the creator of your reality on earth. Everything you experience is brought to you by your spiritual higher self. When you visualize or imagine a desired future reality your spiritual higher self goes forth, vibrationally, to pull a grander version of that idea from the soup of potentiality, and then it creates that reality as a kind of blueprint template reality. And once that work is done, your spiritual higher self calls you towards your already existing desired reality. Your job is to raise your vibrational frequency to the point of being in the vicinity of the vibration of your spiritual higher self, in order to make that reality visible to you as a physical being. You do this by only doing the things you are passionate about, the things you love to do. When you’re on track, you’re in alignment and you feel good. When you feel bad it means you’re out of alignment with the vibration of your spiritual higher self. Misalignment is about the vibrational discord between You and You. That is to say, the reason you're not already experiencing your desired reality is due to your own resistance to your own idea, it's that simple! Your emotions are your built-in guidance system. And thus, your emotions are the true indicators of where you’re currently vibrating. Positive beliefs lead to good feeling thoughts and attitude, a high vibrational state, whereas negative beliefs lead to bad feeling thoughts and attitude, a low vibrational state. Knowing that your emotions are your guidance, you will do whatever it takes to begin to feel better at every opportunity. And when you don’t feel good and you can’t seem to shake those feelings, you will do the mental work necessary in order to change your beliefs and thus you'll feel, think and behave differentially, guaranteed! Because you have Free Will, which means you have 100% absolute freedom to choose, you can create an experience of any desire you have. There’s absolutely nothing that you must do because there's no judge, so why not only do the thing that brings you joy, the thing you love to do, whatever that is, and do nothing else? Although you’re free to choose any experience of reality that resonates with you, within the idea of probabilities, the actual timing and method of any particular manifestation is not in your domain, it’s in the domain of the Universe at large. Thus by placing an absolute expectation on things that are outside of your domain, you’re setting yourself up by allowing for the possibility of dis-appointment and the decreased vibrational frequency and pain that follows, which leads to being misaligned with your desire. Expectation leads to pain, whereas expectancy leads to joy! One of the things that may be holding you out of alignment from what’s wanted is the idea of self-validation or self-worth. Perhaps you're continually seeking attention, approval or validation from apparent others, all the while not realizing that those others are merely reflections of your own state of being. When you’re primarily focused upon and operating from the perspective of your ego-self, without the input and guidance of your higher self, then you constantly seek attention, approval and validation from others around you. Things like: Look at me! How am I doing? Does this look right? What do you think? Does this sound familiar to you? Now consider the action of observing yourself in the bathroom mirror. You don’t look into the mirror expecting it to approve of or validate you - you look into the mirror to get a reflection. In the same way, the outside world is merely a reflection of your current state of being. If you don't like the reflection you see, then you must change yourself! 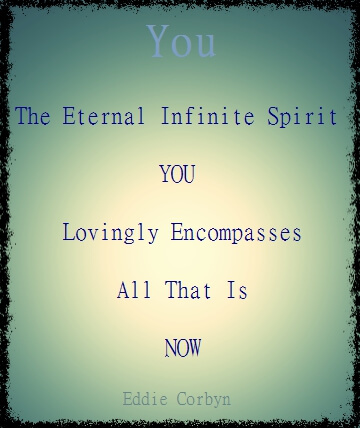 You Are All That Is! Understand that because you exist Now, you deserve to exist and you always have and you always will. There are no extraneous or superfluous creations within existence. There are no spare parts saved for later, just in case they may be needed. Everything that exists has worth and value in the eyes and heart of All That Is. Because you exist as an inseparable part of All That Is, obviously All That Is would not be complete without you, that’s how much you are valued and deserve to exist! To believe that you’re unworthy of anything in life is like saying the earth doesn’t deserve the light and heat of the sun or that the fish don’t deserve the ocean. Even though as a spiritual being you have incarnated as a person into this reality of self-imposed and self-limiting belief systems, at the core of who you really are you’re already fully enlightened and thus you already know and understand all there is to know and understand. This being the case, to understand something new really means to remember something that you already know at deeper levels of your being; it’s the same for every person/being. Are you aware that as spiritual or energy beings we all have chakra energy centers in our body? Please visit this self help tool page that outlines what chakras are in order to understand (remember) for yourself. Chakra energy centers become unbalanced due to misaligned beliefs. This self help tools page goes into the idea of balancing your chakras to better serve you. Once you’ve integrated your ego-self and thus have begun to grasp the truth of the nature of existence, spiritual reality and who you really are, and you’ve started to realize the Oneness of all beings everywhere, then you’ll only see others as they really are, no matter what external form they may present to you at any given time. Because you've realized that every being within creation has worth and value, you’ll see each person as the highest version of them that they actually are and you’ll refrain from seeing them as anything less than that, even though the reflection they’re offering might not represent the highest version of them that they eternally are. Always remember that everyone in this reality is already a Master Creator - so why not see them as such? OK, I’ve taken my brave pills so let’s look at enlightenment. I don’t see enlightenment as some far-off fixed state that we’ll someday reach or achieve by living a totally good or pious life. No. I see it simply as greater understanding (remembering) and a continual moving towards more light. Having transcended many of my fears I don’t take life as seriously as before and so I apply a lighter touch. In other words I’ve lightened up. Whereas previously I was in the dark about certain subjects, I didn’t know about them or understand them. Now, as a result of continual inquiring within and studying the nature of existence, I do know and understand them. I have more light on those subjects or simply: I let more light in so have become more en-light-ened. Part of enlightenment involves transcending your fears, including the fear of death. All true spiritual self help guides have realized and will inform you that we’re all eternal beings and hence, there’s no real need to fear death. The idea of death as something negative is just that, an idea or a belief; it’s not truth per se. We can just as easily hold a belief which states that death represents an ending as well as a new beginning. Life being eternal has no opposite, thus the opposite of death is birth. Birth and death are like two sides of the same coin, one cannot exist without the other. It’s worth checking out what some self help authors teach about death. At the deepest level of existence, we’re all a part of consciousness at large. Consciousness or What Is already IS all of All That Is, already IS fully enlightened, so only new experiences can be added to that state of being! In truth, the only spiritual self help guide you ever really need is your own higher spiritual self. Have a Question for Spiritual Guide? Please submit questions concerning Spiritual Awareness and Higher Self on this spiritual self help guide page. Thank you.